Slave to Fate. Destined to Hate. Pain fuels His rage, His hatred. Is there good in this monster? Shame is Pain, is Hate. No, to defeat His Master. A man screams for help. She brought Obi-Wan to Him. the truth about the pilot. The truth: it’s His son. Dark Lord’s gift of death. maims His foe: His son. more gracious than His Master. the Father and Son battle. A swift and violent attack. tells His Son to strike Him down. His Master strikes, His Son screams. Rise. Stand. Watch. Hear. Feel. His Son in pain, pleads for help. He knows pain, lives pain. Pain. Rage. Hate. Shame. Love. but He has become stronger. Darth Vader, Lord of Death, dies. When I was a child, Return Of The Jedi was always my favorite Star Wars film. Yes, I know The Empire Strikes Back is the most artistic and philosophical of the films. I get it. I do. But the little kid version of me didn’t care about that. I liked Return Of The Jedi for two major reasons. First, there was a conclusion. I wanted an ending and Return of the Jedi gave that to me. It was a good one, too. The heroes won! Yay! 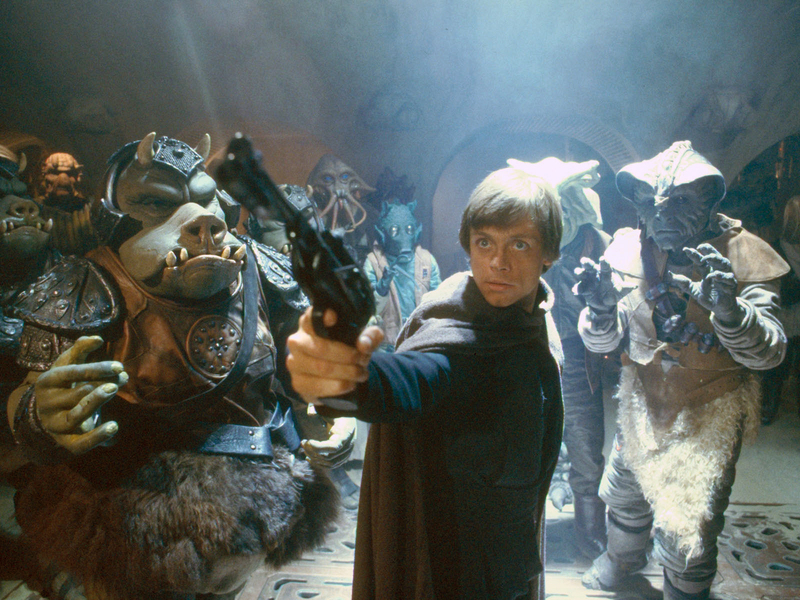 Luke stands before Jabba. Notice how similar he looks to Palpatine (black robe, hood pulled over his head). Second, I loved that we finally got to see Luke Skywalker in Jedi mode! 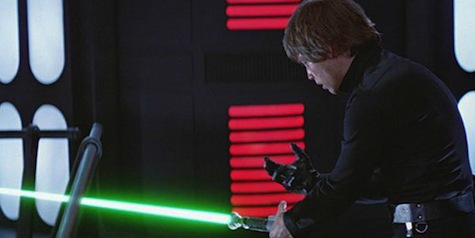 In A New Hope we see Luke awkwardly begin to use his lightsaber. In The Empire Strikes Back we see Yoda put Luke through an odd Jedi workout, the deep and profound spiritual and philosophical significance of which I was far too young to understand. But in Return Of The Jedi, we see Luke in full-on Jedi superhero mode as he rescues Han Solo from the clutches of that vile gangster Jabba the Hutt. As the film begins, R2 plays a message where Luke introduces himself to Jabba the Hutt as a Jedi Knight. When Luke appears at Jabba’s Palace, though, he is clearly sliding into the Dark Side. Physically, he looks just like Vader or the Emperor! He is dressed all in black and wrapped in a black cloak, face shrouded. 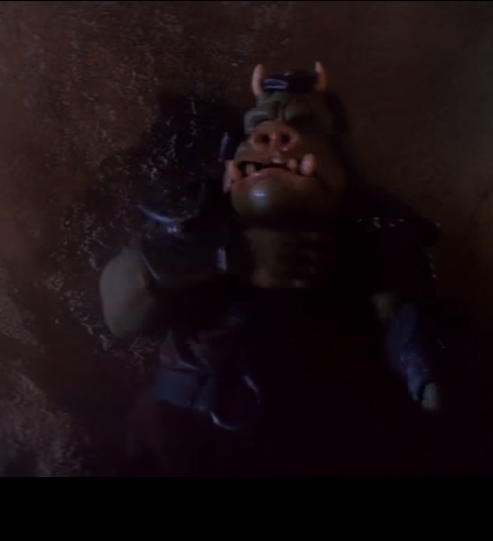 Echoing his father’s actions, he even uses the Force to strangle a few of the Gamorrean guards as he enters the palace. Luke tells Jabba, “I warn you not to underestimate my powers.” Like his father he is focused on his own abilities, cocky, and arrogant. Yoda told Luke a Jedi uses the Force for “knowledge and defense, never attack.” Yet when Jabba refuses to negotiate with Luke, the first thing he tries to do is shoot the Hutt! Luke also threatens Jabba’s life twice. 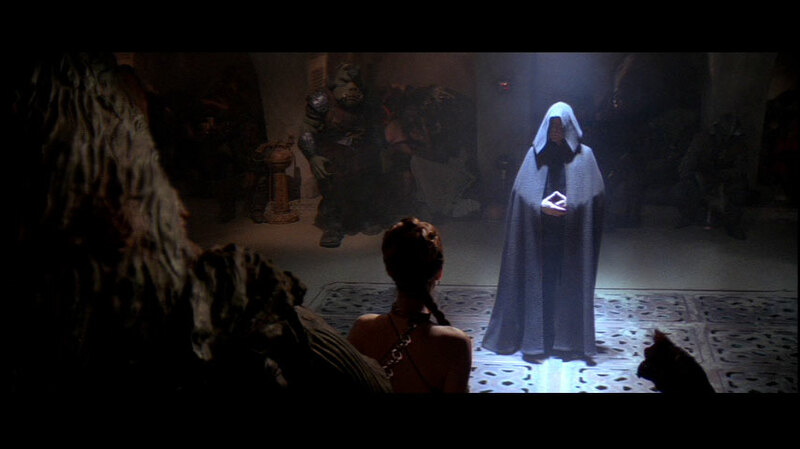 First he tells Jabba, “This’ll be the last mistake you ever make.” And second he demands, “Free us or die.” These sorts of ultimatums and threats are not the Jedi way. From threats to violence to arrogance to vengeance, nothing he does at Jabba’s Palace is of the Light Side. And yet, the hero emerges, the Jedi do return. But they came back in a way that young me couldn’t fully understand. Luke – and by extension the Jedi – wasn’t the sort of superhero I expected. What Luke learns, what Luke does, is more heroic and far more important than anything that filled the pages of the superhero comics I was reading or the cartoons I was watching. 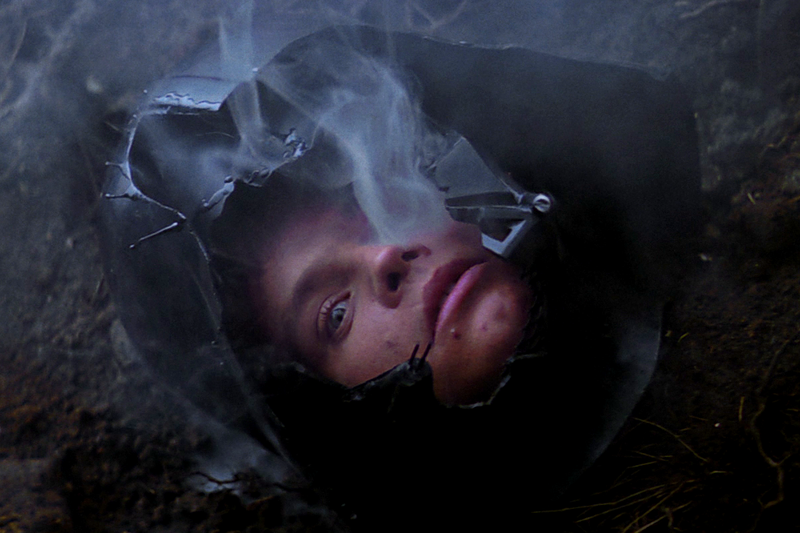 When Luke surrenders himself to Vader on Endor we see the man he was at Jabba’s Palace is no more. 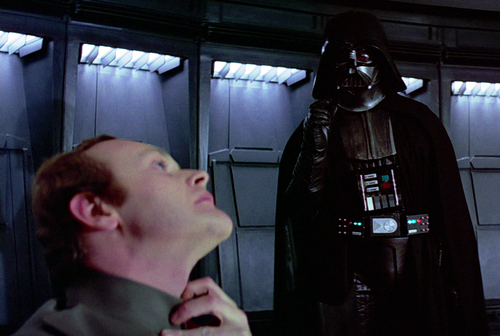 Instead of threatening Vader when he doesn’t agree with him, Luke offers his life. Luke has faith his father can be redeemed. As opposed to the further corruption of a battle tinged with the Dark Side of the Force, Luke is willing to die for what he believes in. Luke is calm, at peace. 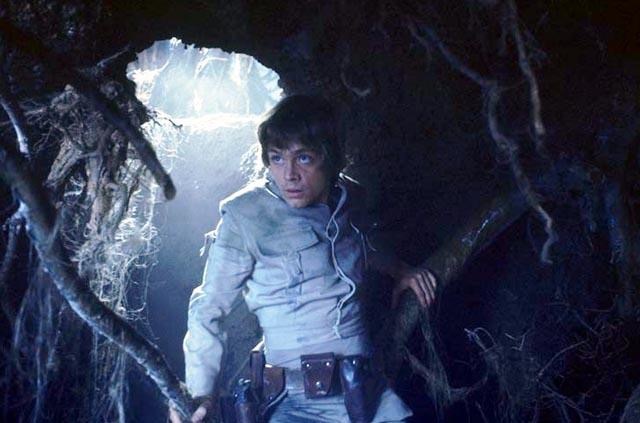 While in the Emperor’s Throne Room aboard the second Death Star, Luke falls in and out of combat with his father, trying to resist the pull of the Dark Side. 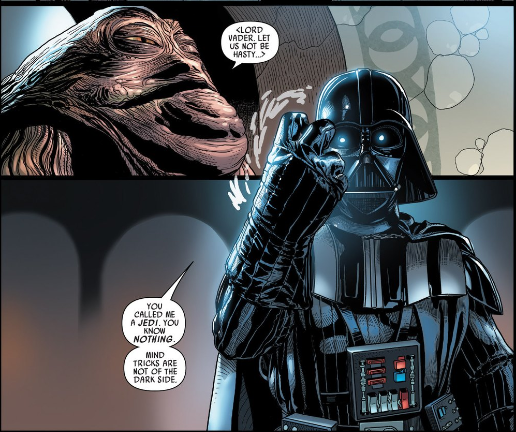 Yet, it is only after he severs Vader’s hand that he realizes the truth of the power of his choices and who he can become. Luke throws away his lightsaber. It is in that moment, with the most powerful line of the film (in my opinion, at least) that the Jedi truly return in Luke. He is ready to die for his belief in the Light Side of the Force and for his belief in his father. Luke is ready to give himself over to something larger than himself; he is ready to be selfless. In that moment of nonviolent resistance and self-sacrifice Luke redeems Anakin. What happened on Mustafar is reversed. Vader is destroyed. Anakin—moved by the love he has for his son who is calling out to him for help—destroys the Emperor, saves Luke, and brings balance to the Force. Now as an adult, Return Of The Jedi is still my favorite Star Wars film but for all new reasons. To me, nothing is more powerful than that moment – where the Jedi return and Anakin is redeemed. It’s brilliant and exciting film-making. Yet its importance comes from how the power of that moment extends beyond the film. Luke not only redeems his father but offers a daring challenge to anyone watching the film. This – love, nonviolence, self-sacrifice, and faith – is the true nature of the Light Side of the Force. This, according to Star Wars, is the true nature of a hero. The question then rests with us as viewers, are we brave enough to follow Luke on that path? Michael J. Miller is a Theology teacher at Mercyhurst Preparatory School in Erie, PA. He has a BA in Religious Studies from Mercyhurst University and an MA in Pastoral Studies from Gannon University. He is proud of the many Star Wars t-shirts in his closet and always keeps two lightsabers in his desk just in case a wayward Sith ever wanders by. He never tires of talking obsessively about all things Star Wars.